Feeling stressed lately? Is the amount of your workload seems to be catching up with your body? Are you losing your youthful glow? Are you a bride to be and the busy preparation is making you feel down? These are just some of the problems that women commonly encounters today. Clarity Aesthetic Medical and Dental Center addresses these problems by promoting the Bloom Campaign. Bloom Campaign's goal is to make women feel beautiful and redeem the youthful glow. The Clarity Aesthetic wants to target that a lot of women can claim the blooming beauty without spending too much for treatments or facials. The campaign includes the offer of great affordable packages that can be availed to achieve a healthier, fairer and younger looking skin. The packages offered is the "Purity" and "Divine". The package can be availed by anyone and the vouchers can be bought until August 31, 2014 but can be redeemed until December 31, 2014. 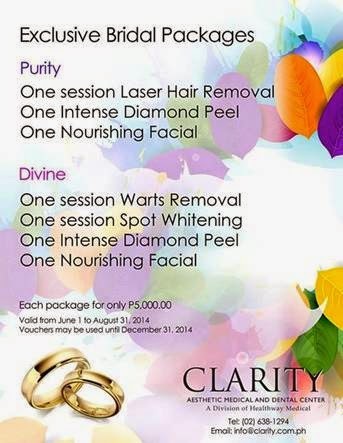 Each package costs 5,000php and you can choose between Purity Package and Divine Package. Purity package includes a session of laser hair removal, one intense diamond peel and a nourishing facial while the Divine Package includes a session of warts removal, one session of spot whitening, one intense diamond peel and one nourishing facial. One package is already complete for the basic needs of skin pampering and quite remarkably it is really affordable. 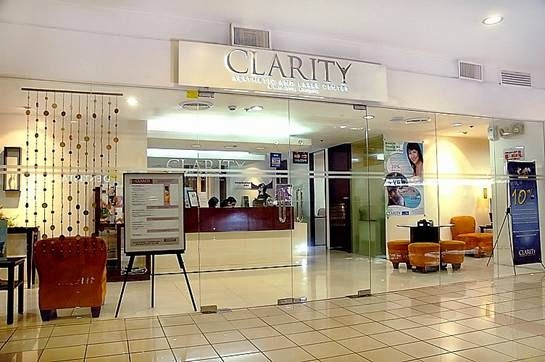 Clarity Aesthetic Medical and Dental Center is a division of Healthway Medical located at the 5th level of Wellness Zone in Shangri-la Plaza Mall at Mandaluyong City, Philippines. The clinic is open from Monday to Sunday at 8AM to 8PM.